I bought this modest, base model, Tacoma off my brother in summer '11 after the transmission chewed itself up. The truck hadn't been well maintained and needed a bit of TLC to whip it back into shape. Other than an aftermarket trailer hitch, no mods, no glam, just exhilarating no-holds-barred 2WD and 3000lb load-bearing glory. Last edited by ToxicGumbo on Mon Sep 16, 2013 3:11 am, edited 7 times in total. That wideband sensor, what have you got to control it? If not, sorry to break the news! 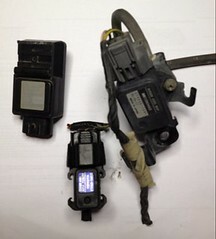 "The Aeroforce wideband air/fuel kit comes with the following: Digital 12 volt Wideband Controller Unit LSU4.9 Wideband Oxygen Sensor 10 ft. Sensor Wire Harness 5 ft. Control Unit to Gauge Wire Harness 5 ft. Power Wire Harness Weld-In Sensor Bung." The last couple weeks I've put in an enormous amount of time into disassembling the Toxic Taco's A43D transmission subcomponents, cleaning them, and rebuilding them with new seals, gaskets, clutches & frictions discs, and evaluating what needs to be replaced due to severe fatigue. In some ways the process has been immensely cathartic and I've had lots of Car Talk, AGCO Automotive Hour, Car Craft, Hot Rod Magazine Live, and Rod & Custom Radio podcasts to keep me company. The rebuild has also allowed me to meet some business owners and technicians in the area who have had colorful histories in the local drag racing scene. 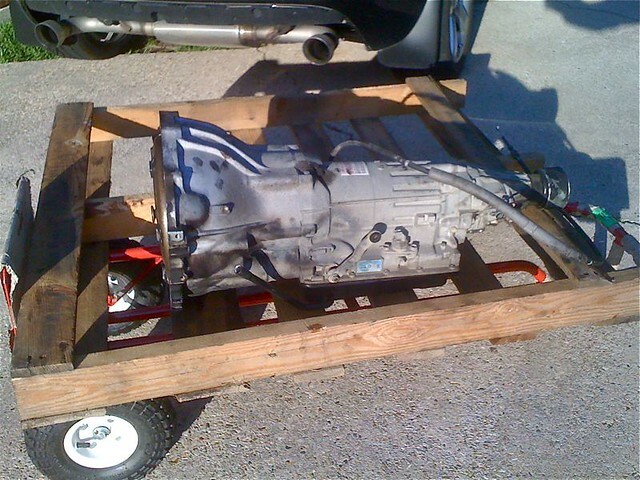 ^ This is the Aisen A43D automatic transmission from my Toyota Tacoma. There are many like it, but this one is mine. 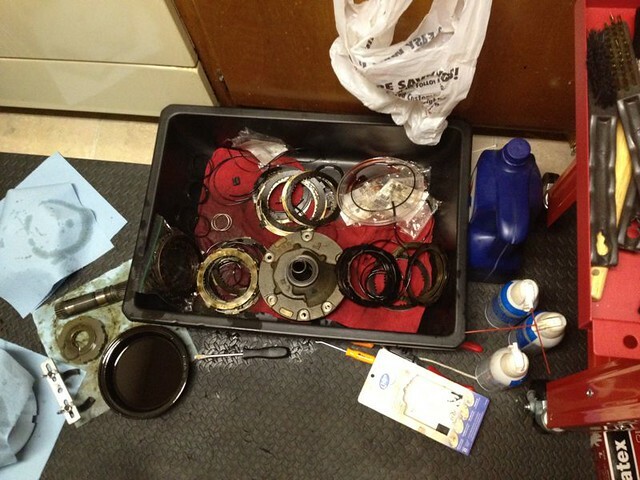 ^ Here's my kitchen/transmission workshop where the magic happens. I don't cook much, but when I do...it involves an impact wrench and lots of Q-Tips. 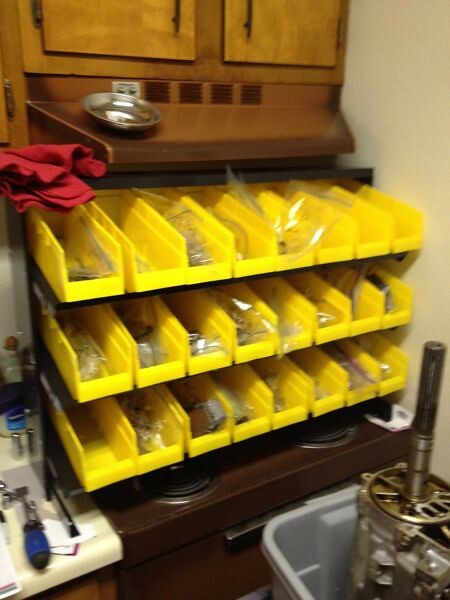 ^ All small parts are kept in labeled zip-loc bags and sorted by steps to match a repair manual. ^ These are parts to be discarded at some point. ^ Notice the shattered gear in the left half of the front pump. You might also notice the imprint it seared into the right half. After 120k miles, you can also see how caked on the transmission fluid is in the surrounding channels. The gloppiness of the transmission fluid's been consistent throughout the entire unit and has made cleaning immensely difficult. 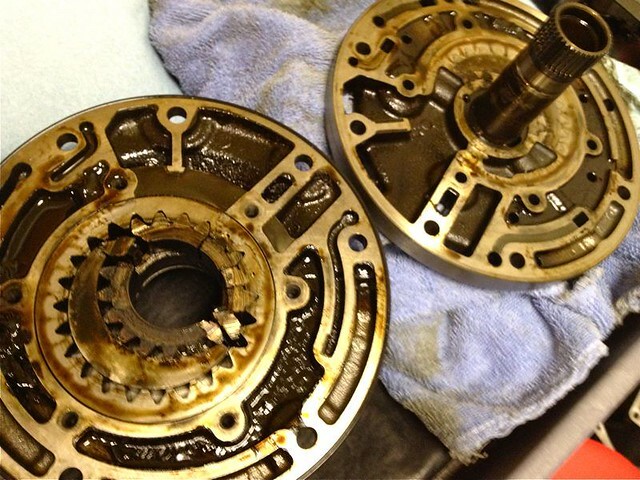 Everything had to be cleaned thoroughly since metal fragments made their way out of this pump and into other areas of the transmission. ^ This one-way sprag fit around the sun gear assembly. 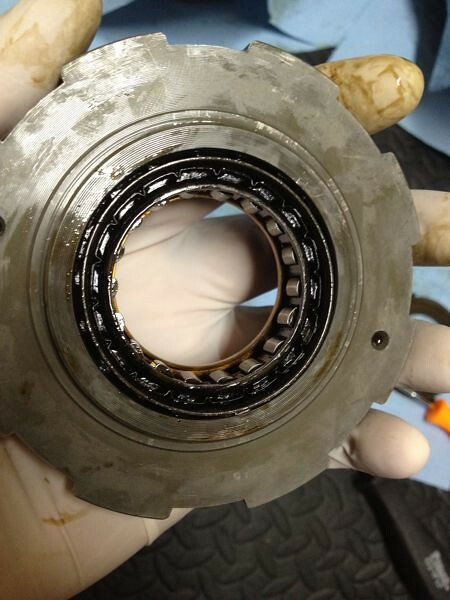 At some point during the transmission failure, it turned into a two-way sprag. If you look closely, you can see how the inner and outer bands have turned out of alignment and caused most of the knuckles to depress. ^ You can see some charring and bowing here of the Number 1 Brake flange and lower friction plates/discs. Both the top flange and snap ring had to be replaced. ^ This is how the case came out after a good cleaning and paintjob. Most of this will get marred up during reinstallation, but I approached the rebuild with a certain amount of pride and want everything looking top notch before reinsallation. 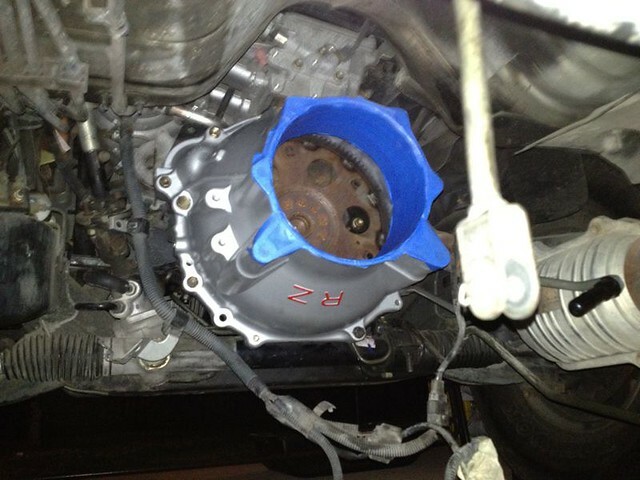 ^ To get the truck running temporarily, I masked off parts of the painted bellhousing and reinstalled it so the starter could be situated. After months of neglecting this rebuild, it was nice hearing everything fire up. ^ Though the brownish transmission fluid looks glossy, it's fairly gloppy and clogging up the valvebody. 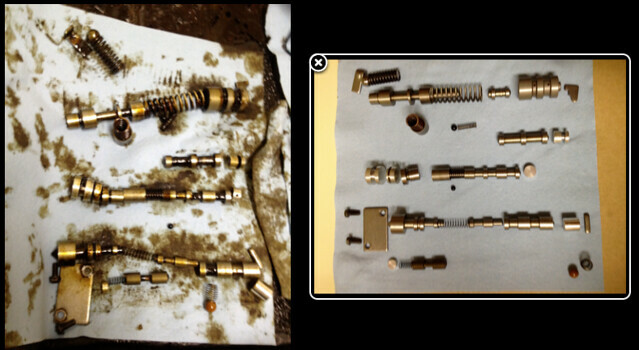 ^ For comparison to the earlier valvebody image, here's a cleaned component. This is about a week away from reinstallation in the vehicle. Hoping for the best. 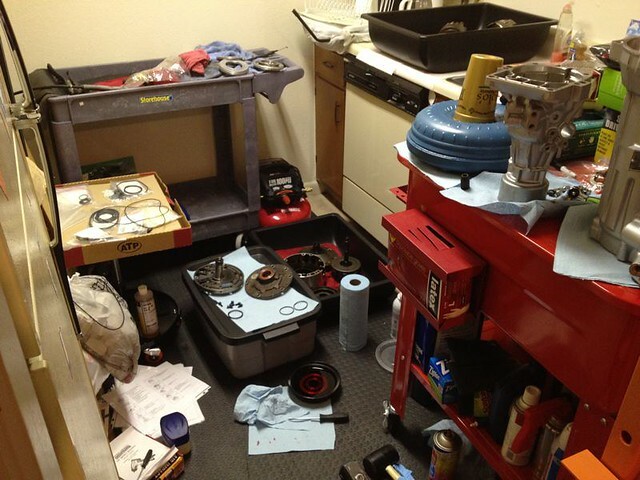 Here's my kitchen/transmission workshop where the magic happens. I don't cook much, but when I do...it involves an impact wrench and lots of Q-Tips. After 120k miles without proper flushes and maintenance, you can also see how caked on the transmission fluid is in the surrounding channels. Fixed it for you :-) My truck went without maintenance for several years when things were tight for my old man, result: dead engine. The trouble with auto tx maintenance is that you can't DIY it properly. When you drain, you only get 2/3 of the fluid, so the only proper way is to pump it in and out until it runs clean. 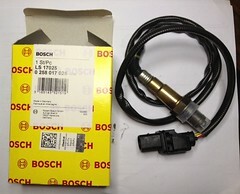 Same goes for power steer units too, though I successfully DIYed a proper power steer fluid change once, that's simpler. 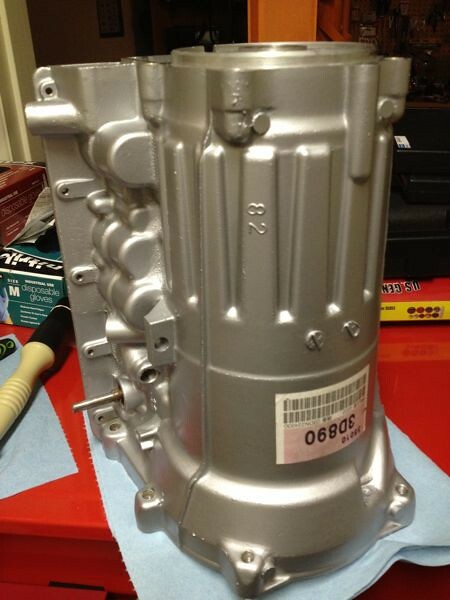 ^ The components above are internals from the lower valvebody of the transmission. 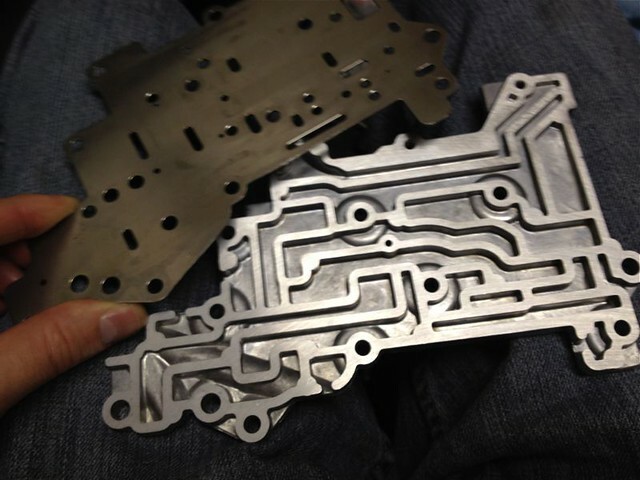 There's something entirely satisfying about clean, machined, parts. These were far more gunked up with gloppy/pasty transmission fluid than is visible here. ^ Here's the lower valvebody. Took about two boxes of Q-Tips and 10 cans of Chemtool to prep for reassembly. Edit: added second photo, edited text. Last edited by ToxicGumbo on Tue May 15, 2012 3:45 am, edited 2 times in total. Be careful with the use of "flush" here. 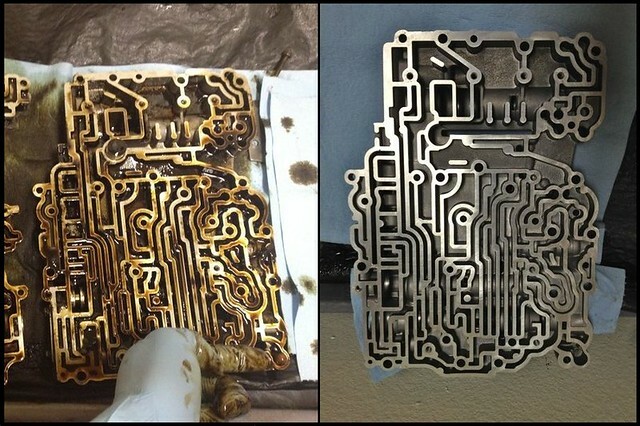 It's clear to me what you're talking about, but a common practice (here in the US anyway) is to perform a so-called transmission flush, which means hooking the transmission up to a machine and running fluid through it backwards, which can result in material caught by the filter to spread back throughout the transmission. 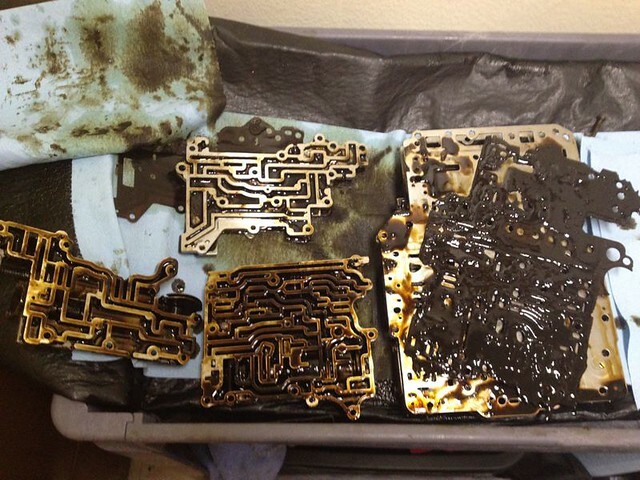 This is one of those money-making scams used by shops that don't want to hire decent techs who can drop a pan and replace the filter. Plus it's a way to make easy money for the shop itself when people come in for warranty work. Mentioning it here as FYI to any and all. 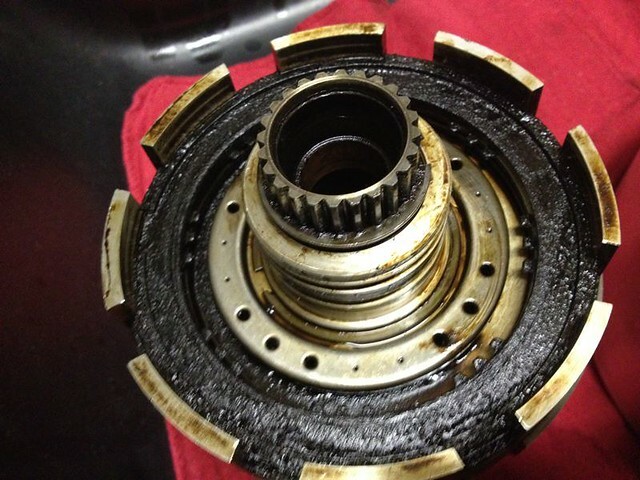 If a shop suggests getting a transmission flush, ask them how they go about it first. If they don't drop the pan and instead start talking about hooking up a machine, rephrase the term to "wallet flush" and mention how the Big 3 are sending around service bulletins to avoid this at all costs...even though they used to encourage it in their own shops in the past. In this case, I used compressed air to blow the remaining transmission fluid out of the radiator coolant lines and will stage fluid increases during the break-in. I'm using transmission fluid and petroleum jelly to lube things up during reassembly and will add a generous amount of the former to the guts, pan, and torque converter before first run.